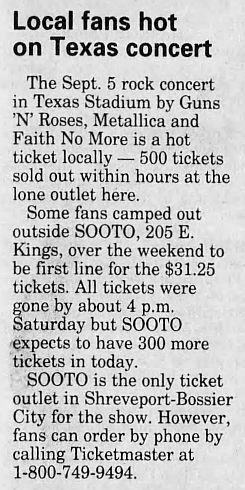 The Sept. 5 rock concert in Texas Stadium by Guns 'Ν’ Roses, Metallica and Faith No More is a hot ticket locally — 500 tickets sold out within hours at the lone outlet here. Some fans camped out outside SOOTO, 205 E. Kings, over the weekend to be first line for the $31.25 tickets. All tickets were gone by about 4 p.m. Saturday but SOOTO expects to have 300 more tickets in today. SOOTO is the only ticket outlet in Shreveport-Bossier City for the show. However, fans can order by phone by calling Ticketmaster at 1-800-749-9494.